Why are the IAS/IPS Vacancies Decreasing when India faces a shortage of IAS, IPS officers? The number of vacancies for services like IAS, IPS, IFS etc as per UPSC Civil Services notification is showing a decreasing trend for last 4 years. This comes at a time when the number of aspirants appearing for UPSC Civil Services exam is growing exponentially since the last 8 years. Last year saw more than 11.36 lakh applicants for UPSC Civil Services Exam. In such a large democracy like India, only 980 vacancies are notified (for all the 24 services like IAS, IPS, IFS, IRS etc combined) for 2017, at a time when there is an urgent need to fill thousands of vacant posts. Though the vacancies may slightly increase after UPSC CSE notification, there is no doubt this meager intake is never adequate to bridge the growing gap of IAS officers. In this post, we analyze the civil services vacancies filled through UPSC CSE for last 10 years in detail. The decline in the posts started from 2014 itself and have been reducing drastically over the last four years. 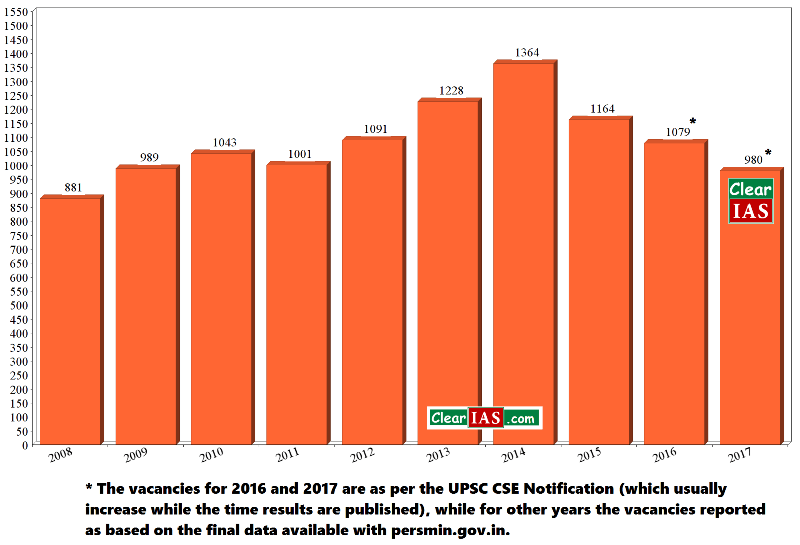 While the reported vacancies at the time of UPSC CSE Prelims notification 2014 was 1291 (for all the 24 services like IAS, IPS, IFS, IRS etc combined), it was only 980 in 2017. Union Minister of State for Personnel, Public Grievances and Pensions Jitendra Singh recently said in Lok Sabha that the India is facing a shortage of about 1,470 IAS officers. There is a shortage of over 1,400 IAS and 900 IPS officers in the country. At present, the nation has 4,926 officers of Indian Administrative Service (IAS) while the total authorized strength of 6,396,” Singh said in recent PTI report. Reports suggest that as many as 3,894 IPS officers are working as against the total sanctioned strength of 4,802. In the case of IFS, as per data received, a total of 2,597 IFS officers is being appointed against their total authorized strength of 3,157 – a gap of 560. A Parliamentary standing committee has recently expressed “serious concern” over the persistent shortage of IAS officers and strongly recommended that all efforts be made to fill these vacancies. “The Committee notes that almost all the key and strategic positions under the Union as well as the states are being manned by the IAS and persistent shortage in the IAS officers ultimately affects governance in the country. The Committee expresses its serious concern over the persistent shortage of IAS officers and strongly recommends that all efforts be made to fill these vacancies,” the panel said. There are issues regarding inadequate capacity to impart training to a bigger batch (the present capacity is 180 officers). In direct recruitment posts, the intake in IAS cannot be increased beyond the limit as it will disturb the pyramidical structure of the service. Taking more than 180 officers per year may “compromise quality”. 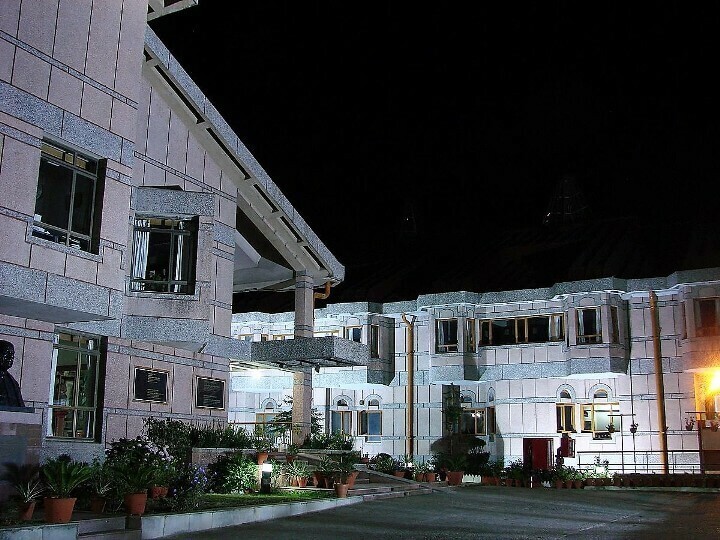 In an emerging democracy like India with more than 125 crore population which aims at double-digit growth, it is extremely strange to cite reasons like the Lal Bahadur Shastri National Academy of Administration – where IAS officers are trained – does not have a capacity for an intake of more than 180 officers in a year. The government should use the people’s mandate to fill the vacancies of IAS, IPS or IFS officers at the earliest by taking necessary steps and building adequate infrastructure at the earliest. Shortage of efficient officers in the higher bureaucracy will add workload of the existing bureaucrats compromising their efficiency as well – due to their work overload. Getting into service like IAS, IPS etc are the dreams of millions in the country. The youth deserve challenging opportunities. Those candidates who miss services by a slight difference in marks are equally capable. If the service intake by UPSC CSE is increased, that would open the door of opportunities to many bright minds in the country. We have adequate brain power in India, and the government should not miss their services. Sardar Vallabhbhai Patel, one of the eminent leaders of the freedom struggle and whose efforts was crucial in the integration of modern India referred the Indian Civil Services as the steel frame of the country. Yes, India Civil Services represent the essential spirit of our nation – the unity in diversity. i do not understand why the leaders or society well wisher do not understand this grave problem and works to minimize this problem by increasing number of seats and also time has come to change whole recruitment system from examination based to training and performance based recruitment.